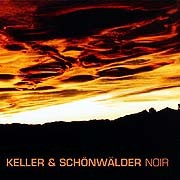 Detlef Keller and Mario Schonwalder are among Germany's most prolific collaborators in electronic sound. The combined output as a duo, with their cosmicmusic cohorts and on their own is significant. This power couple is responsible for numerous volumes of both drifting and driving spacemusic releases - from the concerthall as well as the studio. Noir (75'49") presents wonderful examples of their drifting style of mind music. The title piece (54'49"), realized at their Manikin studio in Berlin, covers the first two tracks in as many movements. Movement One (25'46") is beautiful and mysterious. This sprawling piece opens with dark layers of synth tones and effects, setting the mood early on. With its sustaining chords, wandering melody and elegant largo pace, this passage belongs to the 21st century - the synth-generation's version of the nocturne. Movement Two (29'04") continues on in this fashion and opens up a bit with the introduction of a seemingly random echoed rhythm above which floats, in turns, an endless library of well defined synth tones and choir pads. The energy here is less that of a swirling mass as it is of forward motion - travelling outwards through darkness, guided only by stars. The remaining three tracks (21'00") were recorded live at a Berlin nightclub. The effect of the live setting and the co-mingling of electronic percussion with a conventional drummer (Bas Broekhuis) all helps to give this segment a looser, more earthbound feel. Moving through shadowy shades of reverberant sonorities and improvised interludes of spontaneous sonic invention, the session gradually comes to rest between the invisible connections of spirit and technology.